Our handmade candles are our pride and joy. The small and dedicated team hand-pour all The Pure Candle Company candles in our Northumberland studio. All our candles are handmade using 100% soy wax and fragrances sourced and created in the UK. Our candles are clean burning, with no tunnelling or leftover wax. Due to the organic nature of the materials used in our products, the length of time can vary for the wax to completely melt from the sides of the container. Please see our burning tips & safety section for advice on getting the most from your candle. Many high street brand candles are made by machine from paraffin wax. 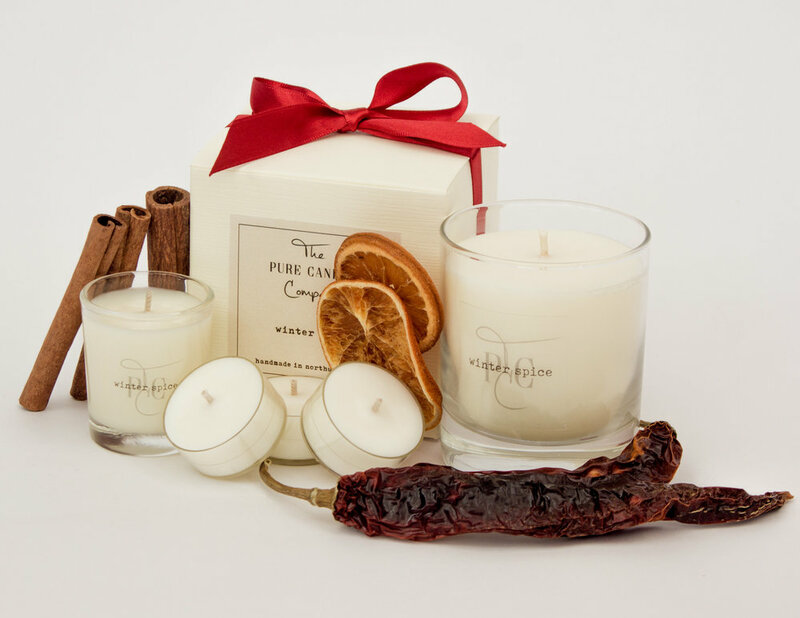 They are a world away from our lovingly handmade candles, which are made from 100% soy wax. Each one of our handmade candles is environmentally friendly in every way. 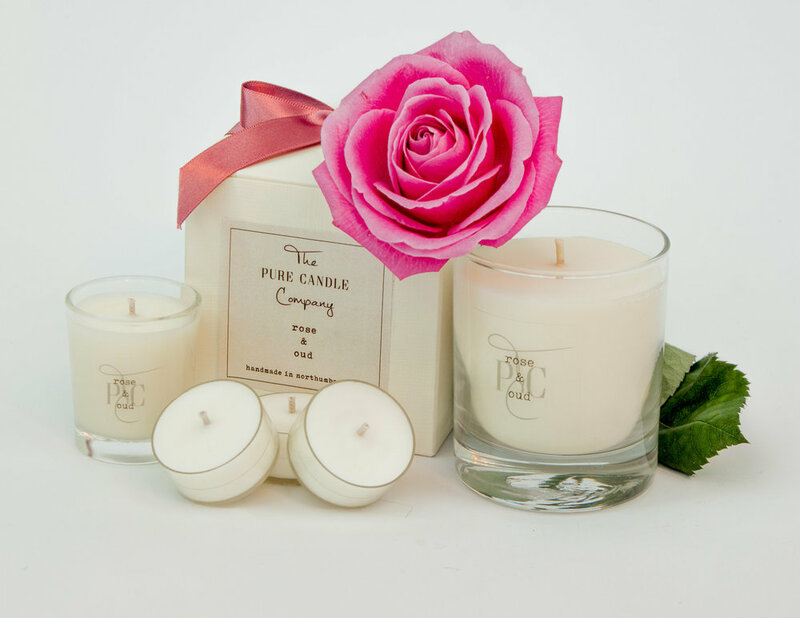 When I started The Pure Candle company I knew I wanted to create luxury handmade candles that were free of paraffin wax. Well, you might be surprised to know that some of the most coveted luxury candle brands contain paraffin wax. If you know anything about burning paraffin wax, you'll know that it creates toxins when burned. Who wants their home being delicately fragranced by a luxury candle if it's also filling it with toxic fumes?! Which is why I spent a long time researching which candle wax to use to create a 100% environmentally friendly, non-toxic candle. Soy wax turned out to be the best choice. Soy wax is biodegradable and is clean burning. This means that it doesn't pump toxic fumes into the air. Soy wax is also great if you're prone to allergies. Did you know soy wax is also water soluble? Which means the soy wax residue can be washed away when you've reached the end of the candle. All of the soy wax we use is from sustainable sources. Our large and small candles are hand-poured into clear glass containers. The containers are easily recyclable. We highly recommend popping a gin and tonic in one at the end of a long day - then lighting one of our candles alongside it! We have a growing family of fragrances, each one inspired by nature. You can see some of our much-loved best sellers below. A beautiful handmade candle fragranced with aromatic rose and sensual oud, blend together beautifully to create this sophisticated fragrance. 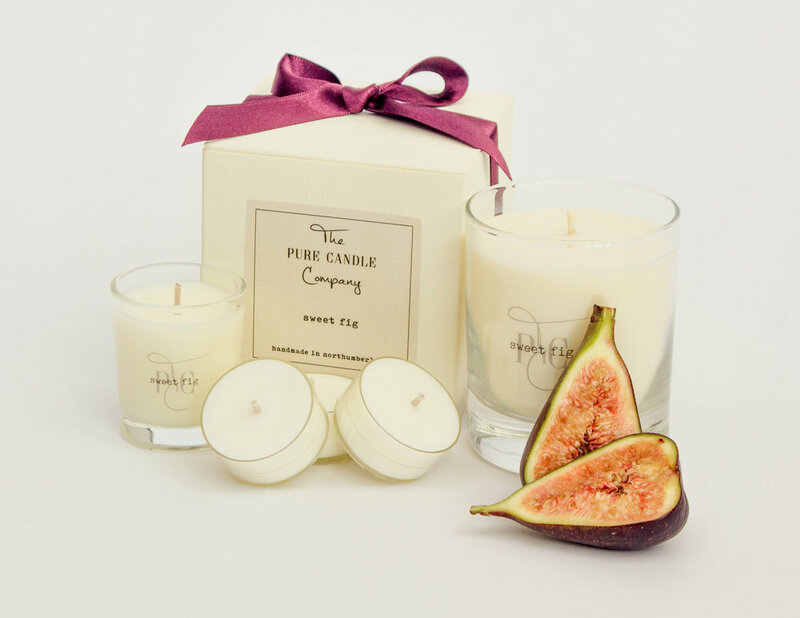 This candle is handmade using a sweet summery blend of fresh fig fruit and green fig leaf. We hand make this candle using a rich fragrance of pink pepper and pomegranate. Winter spice is handmade using a sumptuous blend of warm clove, spicy cinnamon and sweet orange. It’s a best-seller every Christmas, but we think it is rather perfect for any time of the year!